Today’s art is a dot inspired by Peter H. Reynolds‘ picture book The Dot. In the book, a girl named Vashti thinks she is terrible at art. Her art teacher encourages her, and Vashti jabs a dot onto the paper. The art teacher asks her to sign it, and the next day Vashti finds her dot hanging on the wall in a gold frame. She creates more dots, and in one of my favorite pages she even creates a dot by not making a dot (she designs around the outside, leaving a large white circle in the center). The book is very inspiring, as is the follow-up book ish. We use The Dot in a family literacy program I run at the library where I work, and I am always amazed at the wonderful insights the children have about the book. Ever since I first read The Dot, I wanted to try making my own. 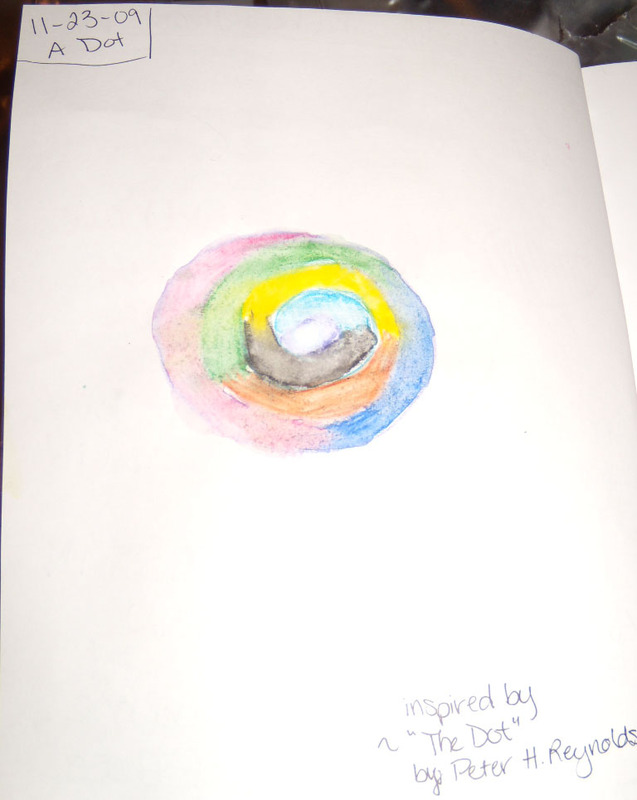 I have watercolor colored pencils (Crayolas), and I first used the pencils to make a spiral, then colored in sections with different colors. Then, using the brush that came with the pencils, I added water and the pencil-shaded areas became watercolors. I will definitely try this technique again, but next time I will use one color at a time, then add water, then another color, etc. And let the water dry in between so it doesn’t get runny! I love "The Dot" book. I read it for the first time about a year ago. Your dot is wonderful. Love how the colors go with one another in such a soft way. I love your dot painting! I also love the story you told about the book. Now, I have to go get them! My grandchildren love to draw and I'm trying to open myself up to drawing and painting too. Thank you so very much for sharing this with us and at this time.